Though the International Consumer Electronics Show officially starts Tuesday, electronics and gadget makers look to get a head start on the rush of product announcements at Monday night’s Digital Experience. The annual press-only event held by tech showcase company Pepcom usually features a cavalcade of new products, some of which are of particular interest to Mac and iOS device users. We spent a few hours combing the floor and found a few Mac and iOS things that stood out. 2012 is the year of getting healthy: We couldn’t walk down a full aisle at Digital Experience without running into at least one fitness- or health-related product. 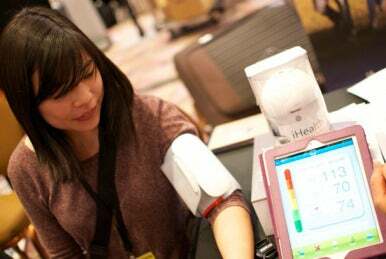 iHealth demonstrated its Wireless Blood Pressure Monitor that measures your blood pressure and then sends it to an iOS app. The app gives you a reading on how normal (or dangerous) your current blood pressure is, and also lets you track your blood pressure across time. The company plans on releasing the product in summer of 2012; the price is still to be announced. 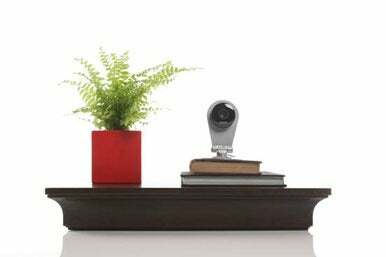 The wireless monitoring company released its first product several years ago; with Dropcam HD, however, it’s finally come into its own. With a sleek interface, 720p cloud recording, and night vision, the camera is small and well-featured, and can be mounted to the wall or nestled in an aluminum stand. Dropcam HD is available for pre-order at $149 now, with shipping to come later in January. There are plenty of stands for your iOS or other tablet device, but, as we’ve come to learn, none so much fun as magnets. Stick one of iOmounts’s small magnetic washers to the back of your device or case, and it will instantly cling to a similar magnetic washer attached to the stand. They tilt, swivel, and turn with the best of them, and the group of men at the iOmounts booth were all too happy to show off their debut items, the iOstand and iOmni. The company was set to take pre-orders on Tuesday, though prices hadn’t been posted as this story was published. Speaking of iOS stands, iPhone mount Swivl caught us by surprise: Plug your phone into the green-and-black contraption and carry a keychain-sized remote in your pocket, and it will scan from side to side as you move, following much like an obedient puppy. You can also use the remote to pan from top to bottom and start and stop recording. $159 for pre-order; shipping to come sometime in the company’s first quarter. The darling of 2010’s CES returns with version 2.0, sporting 720p HD recording and a new iOS app. Developers have something to cheer about, too: Parrot is releasing the source code for its flying device to any interested parties. The Wi-Fi enabled wireless quadricopter will sell for $300 when it hits stores later this year. While Altec Lansing is keeping active in the AirPlay arena, the company’s biggest 2012 announcement isn’t a particular speaker; instead, Altec Lansing is promoting its upcoming Live platform—similar to Sonos’s multi-room system—which integrates with the company’s new line of Wi-Fi speakers to play content from your music library, Pandora, and more. A free iOS, Android, or desktop app can control your speakers, adjusting the volume, song, and source. The first speaker to benefit from Live will be Altec Lansing’s Live 5000 Wi-Fi Speaker system, which the company expects to release in early summer for $500. Equipped with an active noise canceling system, the Zik Parrot by Starck is one of the most luxurious headphones we’ve seen. According to the company, the headphones insulate listeners from surrounding noise in order to provide the purest sound experience. The ZIK aims to recreate the way users naturally listen to sound, like the music is coming from in front of you. Touch panels are located on the entire surface of the ZIK’s right earpiece, making it possible to swipe the panel vertically to set the volume, or swipe it horizontally to forward or rewind. The headphones are scheduled to launch in 2012, with the price still to be announced. Video editing gets easier and more automatic with the release of Magisto, a free iOS app that lets you shoot video and then does the editing for you. We’ve seen similar apps like Animoto, but what sets Magisto apart is that it isn’t about creating videos from still images or for novelty purposes. The app analyzes your videos, edits for what it recognizes as the most compelling clips, adds transitions, and voila—your amateur video looks significantly more professional. The app is available now for free on the App Store. Disney Publishing, the creators of iOS book apps such as Don’t Let the Pigeon Run This App and Mickey’s Spooky Night Puzzle Book, announced the release of two new comic apps at CES on Monday. Avengers Origins: Hulk and Avengers Origins: Assemble! are both based on the original Marvel Origins series and are narrated by Marvel comics creator Stan Lee. Both apps will be available for purchase on the App Store for the iPad, iPhone, and iPod touch in February. Peel, the app that brought wireless home-theater control and TV show recommendations to your iOS device, has undergone an update to include social features. Users can now share their favorite television shows with their social network, as well as follow other users, browse their friends’ favorite shows, and share to other social networking sites such as Facebook and Twitter. The app is available now, for free in the App Store. Not everything we saw was iOS- or Mac-related. But that doesn’t mean those products didn’t spark our interest. For instance, we finally got our hands on Nest, the touch-controlled thermostat created by former Apple iPod and iPhone hardware development chief Tony Fadell. It was just as sleek and user-friendly as everyone has been saying. The Roku Streaming Stick, another recent hot-topic item, was on display at Digital Experience as well. It seemed like there was always a crowd around the latest and smallest streaming television product. Having the stick docked in your television set is like having a traditional Roku set-top box—you’ll get Roku’s 400 plus channels and apps, including content from Netflix, HBO, Vimeo, Hulu Plus, Pandora, Vimeo, and Amazon’s video service. The product will be available in the fall; a final price is still pending. CES wouldn’t be CES without a few robots, and one of the most intriguing was Tosy’s Future Robot, which we watched dance to upbeat tunes. The brand-new entertainment robot definitely put a smile on our faces, even if it isn’t the most practical product of the show. Tosy also has pop stardom going for it—Justin Bieber, the biggest celebrity appearance of CES 2012, is scheduled to appear at the company’s booth on Wednesday.